She’s a California sorority girl who’ll do anything to keep her man. Even if it means going all the way…to law school! Reese Witherspoon (Election) stars with Luke Wilson (Charlie’s Angels), Selma Blair (Cruel Intentions), Matthew Davis (Pearl Harbor) and Victor Garber (Titanic) in a knock-out comedy with a heart of gold -- and hair to match! Elle Woods (Witherspoon) is a California blonde with couture clothes, fabulous friends and the hottest boyfriend on campus. So when Warner Huntington III (Davis) suddenly dumps her and heads for Harvard Law School, Elle takes matters into her own perfectly manicured hands. She enrolls too! Now getting Warner back should be a snap, right? Wrong! Elle’s about to begin the toughest fight of her life -- for love, honor, justice and respect for blondes everywhere! Box Office: Budget: $18 million. Opening Weekend: $20.377 million (2620 screens). Domestic Gross: $93.933 million. DVD: Widescreen 2.35:1/16x9; audio English Dolby Digital 5.1, Spanish Dolby Surround 2.0, French Dolby Surround 2.0; subtitles English, Spanish, French; closed-captioned; double sided DVD-14; 32 chapters; rated PG-13; 96 min. ; $26.98; street date 11/06/01. Supplements: Audio Commentary With director Robert Luketic, actor Reese Witherspoon, and producer Marc Platt; Audio Commentary With costume designer Sophie de Rakoff Carbonell, production designer Melissa Stewart, director of photography Anthony B. Richmond, screenwriters Karen McCullah Lutz and Kirsten Smith, and animal trainer Sue Chipperton; “Inside Legally Blonde Featurette; “The Hair That Ate Hollywood” Featurette; Hoku “Perfect Day” Music Video; Trivia Track; Trailer. Does a movie need to gross more than a hundred million dollars to be considered a hit? Nope - it’s all about expectations. For example, I thought The Phantom Menace required a US take of at least $300 million to reach positive territory; even though very few films ever reach that rarified air, that flick lived in a different universe than most. 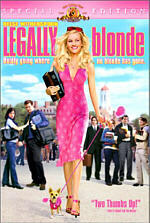 In the US, Legally Blonde earned about $94 million. As of October 15, 2001, that placed it 14th on the list of the year’s top-grossing flicks. By the time all the 2001 releases have run their course, I doubt it’ll make the top 20. Yet I consider it to be one of the year’s bigger hits, all because of expectations. Unlike big summer brethren like The Mummy Returns and Pearl Harbor, no one really thought Blonde would do much. It was a simple comedy without any big stars or much advance buzz. However, it turned out to be the little flick that could, as it consistently raked in decent amounts of money for a reasonably long period of time. Most of the summer movies grabbed oodles of bucks in their opening weeks and then faltered badly, but Blonde just kept it coming, and with a budget of only $18 million, it made a sizable profit for MGM. It’s hard not to root for a movie that rises above its modest origins, and I really wanted to like Blonde. I hoped that it would include more than just endless riffs on the same “fish out of water” theme. However, for the most part, this didn’t occur. Ultimately, Blonde offered a moderately enjoyable experience, but not one that did much to stand out from the crowd. Reese Witherspoon stars as Elle Woods, a cute but apparently superficial college woman who cares mainly about clothes, parties, and her pre-law boyfriend Warner (Matthew Davis). At the start of the movie, all her sorority sisters swoon because they anticipate Warner will finally Pop the Question. However, during a fancy dinner, he uses the occasion to formally dump Elle. He plans to be a politician someday, so he feels he needs a more “serious” spouse. Devastated, Elle swears she’ll get him back, so she attempts to prove her devotion by accompanying him to Harvard Law School. For a number of reasons - most of which revolve around the tiny bikini she wears in her application video - she actually gets into this prestigious club, but the eternally perky and confident Elle soon finds that law school’s not all torts and motions. Most of the other students quickly dismiss her as a dumb blonde, and Warner’s already moved on to more practical girlfriend, dour classmate Vivian Kensington (Selma Blair). Despondent but not down for the count, Elle redoubles her efforts to prove her worth, with results that won’t seem particularly surprising to the viewer. Eventually she garners an important internship and finds herself as part of a team to defend exercise guru Brooke Taylor-Windham (Ali Larter) in a murder trial. However, Elle still has a few bridges to cross as she attempts to succeed in school and in love, whether with Warner or new potential boyfriend Emmett Richmond (Luke Wilson). Legally Blonde is a hard film to dislike it doesn’t try to reinvent the wheel. The movie posits itself as little more than a light and frilly piece of comedic fluff with some basic “believe in yourself no matter what!” messages tossed in as well. However, while Blonde didn’t need to reinvent the wheel, it at least should have tried to shine it up a little. Very little of the film tries to stand out from other efforts of this sort, which means that it ultimately seems somewhat flat and lackluster. Oh, a number of the jokes work acceptably well, but the lack of inspiration seems clear, and the absence of much creativity causes some problems. On the positive side of the ledger is the movie’s star. Just like Elle, Witherspoon has proven herself to be more than just a pretty face, and she’s turning into one of the stronger young actors in the marketplace today. She may not always pick the best projects, but she rarely comes across as less than terrific. Witherspoon’s cameo in Little Nicky almost saved the movie, for example, and she offers some solid work as Elle. Witherspoon ensures that Elle actually has some life and dimensionality; there’s an intelligence at work beneath the surface even when Elle seems shallow, and Witherspoon fleshes out the cartoony character into a reasonably real human being. She adds a wide variety of small flourishes that make Elle much more entertaining than she should have been, and these touches mean that Blonde works better during a second viewing than I expected; I noticed a lot of small moments that slipped by initially, and Witherspoon was a consistent delight. The remaining cast members are unable to bring much depth to their roles, but none of them cause any problems, and they generally seem solid. Davis appears suitably oily as Warner, and Blair manages a hissable coldness as Vivian. Wilson comes across as fairly dull, but he feels appropriately charming at times and we can sort of see why Elle would be interested in him. Director Robert Luketic does little to enliven the proceedings, but he fails to harm it either. The movie progresses in the expected manner and functions in almost exactly the way one might anticipate. In the end, it works reasonably well, largely due to the winning presence of Reese Witherspoon, but Legally Blonde lacks the spark that might make it a more exceptional piece of work. Legally Blonde appears in both an aspect ratio of approximately 2.35:1 and in a fullscreen version on this double-sided. A DVD-14, side one is dual-layered and contains both versions of the movie, while side two is single-layered and provides most of the supplements. The widescreen image has been enhanced for 16X9 televisions. Only the widescreen picture was reviewed for this article. While not flawless, I found the image to seem very satisfying as a whole. Sharpness consistently appeared terrific. Throughout the film, the image remained crisp and detailed at virtually all times. I detected no soft or fuzzy shots, and the picture also lacked jagged edges or moiré effects. In addition, edge enhancement seemed to be absent. As for print flaws, a few appeared during the film, but they stayed minor. Some light grain popped up during a few interiors, and I saw occasional speckles and a little grit, but these were largely insubstantial. Colors offered a strong aspect of Blonde. Mainly due to Elle’s ever-changing wardrobe, the film boasted a broad and varied palette, and the DVD replicated these tones nicely. The hues came across as bright and vivid with good clarity; I saw no concerns related to noise, bleeding, or other problems. Black levels also seemed deep and rich, while shadow detail appeared to be appropriately dense but not excessively thick. Overall, Legally Blonde offered a very good visual experience. Most comedies maintain subdued soundtracks, and the Dolby Digital 5.1 mix of Legally Blonde fell into that category. The soundfield remained heavily anchored in the front realm. The forward channels provided decent stereo imaging for music and effects, as sounds appeared in the appropriate locations and blended together efficiently. Not a lot of movement occurred across the speakers, but the mix seemed reasonably well integrated nonetheless. As for the surrounds, they offered light reinforcement of music and effects at most. Frankly, I usually wasn’t really aware that any audio came from the rears; the mix really did stick strongly with the front speakers. Although the soundfield seemed bland, the quality of the audio helped compensate for any shortcomings. Dialogue appeared consistently natural and distinct, and I detected no problems related to edginess or intelligibility. Effects played a minor role in the film, but they sounded accurate and clean, with reasonable presence and no signs of distortion. Music worked fairly well, as the score and the pop tunes presented good clarity. Highs seemed crisp and bright, while bass was acceptably rich and warm. In the end, the audio was nothing special, but it suited the film well. As a special edition release, MGM packed Legally Blonde with a slew of features, including two separate audio commentaries. The first comes from director Robert Luketic, actor Reese Witherspoon, and producer Marc Platt. All three were recorded together for this running, screen-specific track. Many audio commentaries suffer from an overabundance of happy talk, and this one was no different. Not that it totally lacked any information, as the track added some interesting notes about the production. We heard about deleted scenes and various production challenges along the way. However, the profusion of praise really seemed to dominate the commentary, as much of the time we simply learned how great everyone and everything was. I thought the track offered some decent data, but it was a thoroughly average piece as a whole. The second commentary features a mix of crewmembers. We hear from costume designer Sophie de Rakoff Carbonell, production designer Melissa Stewart, director of photography Anthony B. Richmond, screenwriters Karen McCullah Lutz and Kirsten Smith, and animal trainer Sue Chipperton. This commentary used an unusual form of construction. Here’s how it worked: the track started with remarks from Richmond. After a period of time, he departed - literally. His comments didn’t just cease; he said “goodbye” and the next participant, Stewart, entered the scene. After a little while, Carbonell joined her, and eventually Chipperton sat in with the pair for a few minutes. They then split, and Lutz and Smith hopped in to finish the film. This set-up worked acceptably well, though I definitely prefer the standard format for edited commentaries. It seems more effective to gather remarks from all the participants and then drop them in at appropriate times. The way this one goes, the speakers don’t necessarily have much to say at particular points. As such, we occasionally encounter a few semi-lengthy pauses, especially during Richmond’s portion. Overall, I felt the commentary provided a generally decent discussion. This one included more useful information than found in the first track, though it still tended toward happy talk much of the time. The notes from the screenwriters were definitely the best parts of the commentary. They related details about how the modified the original novel and lots of changes made to the original script. They also talked about some of their less compelling ideas and provide a fun look at their work. Ultimately, the second commentary seemed good but it still was fairly average. In addition to these two commentaries, Blonde features a Trivia Track. This piece uses the subtitle area to provide “Pop-Up Video”-style tidbits. Unlike most text commentaries, this one doesn’t restrict itself to the bottom of the screen. Instead, the pastel-colored notes show up all over the picture, which seems cute but can get a little annoying; the presentation blocks significant portions of the image and can interfere with the movie too significantly. Otherwise, I thought this was a minor but enjoyable offering. It combines some production notes with comments about the participants and general trivia about all sorts of related topics. My favorite tidbit? Learning that Bruce Thomas, who plays the UPS Guy, also portrays Batman in those OnStar commercials. The “Trivia Track” isn’t a “must watch” piece, but it adds some flair and information to the subject. A collection of Deleted Scenes starts with a 30-second introduction from the director. After that, we find eight different unused clips. Most of those also come with opening comments from Luketic. They run between 36 seconds and 129 seconds for a total of nine minutes and 15 seconds worth of material (counting the intros). These can be viewed individually or as a whole via the “Play All” option. As a whole, these clips are worth a look, but there’s nothing terribly memorable about them. It seems obvious why most were omitted, as none of them add anything to the film. Luketic’s brief intros confirm these thoughts, as he quickly discusses the reasons why the snippets didn’t make the final cut. Inside Legally Blonde gives us a pretty standard promotional “making of” program. The 21-minute and 35-second piece provides the standard mix of movie clips, a few shots from the set, and interviews with a variety of participants. We hear from producer Marc Platt, novelist Amanda Brown, screenwriters Karen McCullah Lutz and Kirsten Smith, director Luketic, and actors Witherspoon, Matt Davis, Victor Garber, Holland Taylor, Selma Blair, Jennifer Coolidge, and Jessica Cauffiel. In the spirit of the film itself, “Inside” keeps things light and fluffy, but it actually provides a reasonable amount of decent information. The appearance of novelist Brown is a welcome addition, as it’s interesting to hear her point of view firsthand. Otherwise, many of the notes stay in the “everything’s great!” vein, and the emphasis clearly remains glossy and promotional, but I felt the show was acceptably interesting. The Hair That Ate Hollywood offers a nine-minute look at blondeness. Another featurette similar to “Inside”, this one mixes the usual film clips, on-set material, and interviews with Luketic, key hairstylist Joy Zapata, hair color director Nancy Braun, screenwriters Karen McCullah Lutz and Kirsten Smith, producer Marc Platt, Reese Witherspoon, and hair colorist Dawn Ellinwood. They provide a discussion of the joys of being blonde, with some notes about hair color in general and its use in the film. We also get a catalog of all 40 - that’s right, 40! - hairstyles worn by Witherspoon in the flick. Wow - that’s an average of a new ‘do every two minutes and 24 seconds! “Hair”’s a pleasant little piece but nothing special. Finally we find the theatrical trailer for Blonde as well as an ad for the special edition DVD of The Princess Bride. In addition, we get a music video for Hoku’s “Perfect Day”. The clip lasts three minutes and 55 seconds, which includes a short soundtrack promo. “Perfect Day” is an innocuous but reasonably bright little pop song, and Hoku’s fairly easy on the eyes. Spooky trivia note that made her seem less attractive to me: her father is famed Hawaiian lounge singer Don Ho! Unlike many MGM DVDs, Blonde doesn’t include a booklet with production notes. However, it does toss in a coupon for $2.50 off a ½ fluid ounce Nicole nail lacquer or nail treatment, so who am I to complain? By the way, it doesn’t qualify as a DVD extra, but it was cute enough to mention anyway: the press release for Legally Blonde came on the same kind of perfumed stationery used by Elle in the film. Legally Blonde hit a nerve last summer. A quiet female-oriented comedy amidst a rash of loud action flicks, it pulled in surprisingly solid box office numbers and emerged as the season’s sleeper hit. I felt that movie lacked much depth or general spark, but Reese Witherspoon provided a terrific lead performance that helped make the movie enjoyable. The DVD offered consistently good picture and sound plus a nice mix of supplements. I remain less than excited about Legally Blonde as a movie, but it’s a generally entertaining and unassuming effort that should work for a fairly broad audience, and the DVD’s a nice effort across the board.